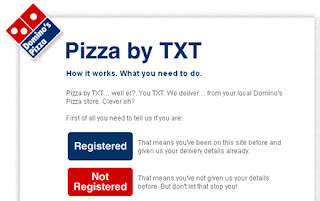 Following successul trials, Dominos is launching a new way to get pizza delivered - the Pizza by TXT service. The pizza co, which has 470 outlets in the UK, said it was the first time UK customers would be able their mobiles to make orders. More than 2,000 users have already signed up for the service since it trialled in July. To use the service, you have to register your full details online, but from then on it seems dangerously easy to order. Once you're registered you then need to set up your "favourite meals" by texting them to Dominos, and give them a code name that you'll remember. Then, anytime you want to order one of your pre-set favourites you text the name to Dominos and they'll do the rest.